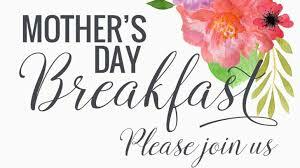 Our annual Mother’s Day Breakfast will be held in Fellowship Hall at 9:30 a.m. on Sunday, May 12th. Multiple committees and individuals are working to make this a fun and relaxing morning experience. Admission is free. All we need is an approximate number of attendees so that we may order the food and beverages. The menu will include delicious egg dishes, French Toast sticks, fruit, bacon/sausage, breakfast potatoes, pastries, juice and coffee, tea. Please let us know your name and ​t​he number of family & friends attending with you.